It started as a niggle in my lower back two days ago, something I chalked up to sitting for too long, the occupational hazard of being a writer, I suppose. A night of agonizing back spasms through permanently clenched teeth had me Googling “Saigon + chiropractor” and led me to an expat forum where I discovered the American Chiropractic Clinic, an ad for which I remembered seeing in this magazine. However, it was the soothing, professional tone of Dr. Wade Brackenbury, the clinic’s founder, that caught my eye. Add a central D3 location, and I immediately booked an appointment for that morning. Pulling up to the clinic, two surprisingly proactive security guards helped me park my bike and opened the door for me, a small gesture, but most welcome as I shuffled into the clinic with the deliberate gait of an 80-year-old. First impressions remained good at the sight of the bright, spacious reception area that would be welcome in any Western city, staffed by friendly personnel who helped me fill out the paperwork. Formalities completed, I was ushered in to meet Dr. Sandy Dargere, one of the clinic’s 12 doctors. After a thorough assessment, he uttered one of the most beautiful sentences I’d ever heard: “You’re going to be fine in 7-10 days.” No spinal problems, he confirmed. The pain was due to a misalignment in the lumbar area, muscles tightening up like a rusted bicycle chain in response to some stress or injury. Dr. Sandy then asked me to stand up and bend over and I immediately groaned at the thought. My hands could barely reach my knees, but after some deft manipulation, his nimble fingers seeking out all the tension spots in my back, I could now reach my shins. A small but welcome improvement. I arrive for my second treatment and I’ve never looked forward to seeing the doctor so much, knowing that relief was just minutes away. It was another difficult night, an electrical storm of pulsating spasms ensuring I only got snatches of sleep. Standing up with my back pressed against the wall or sitting ramrod straight seemed to be the only positions that didn’t induce the next wave of pain. The walking stick I used while trekking Sapa just a few weeks earlier now served the ignoble purpose of simply helping me sit up. Deep breaths are impossible because it feels like my chest is enclosed in a vice. Dr. Sandy has me lay down on a motorized chiropractic table. “So much tension,” he says as he feels my muscles twitching. “Relax,” he coos, before beginning his manipulation of the muscles that have seized up. I exhale deeply, preparing myself for the inevitable pop that follows. I learn later that the extremely unnerving sound has nothing to do with bones or joints being put back into place. Rather, it’s gas bubbles being released into the joint fluid, restoring range of motion. To me, every pop sounds like angels singing. After the manipulation comes my favorite part, the physiotherapy. 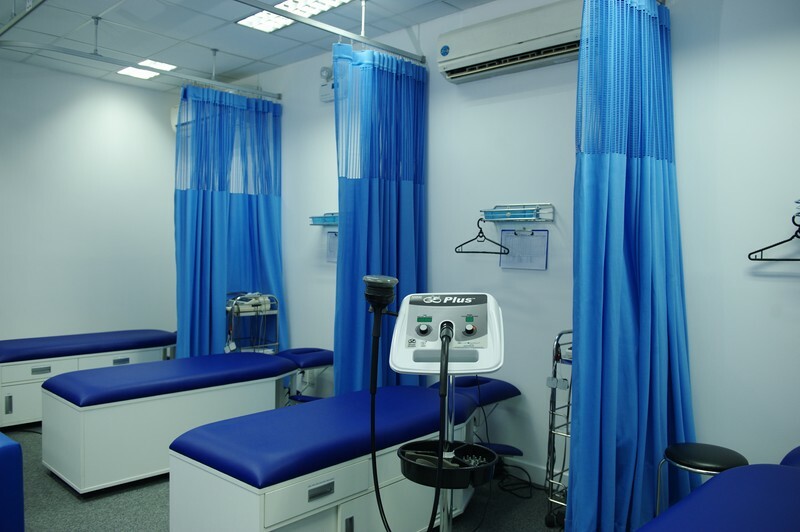 The clinic has 20 stations staffed by 23 physiotherapists. I lie face down while the therapist takes me through the cycle of therapeutic ultrasound, electrotherapy and massage. Just like the therapist the day before, she tells me exactly what she’s about to do before she does it ― applying the cool gel, finding my comfort level for the electrotherapy, confirming where to focus the ultrasound ― all which I find very assuring. It’s 30 minutes of bliss as I feel warm electric pulses stimulating my back muscles. I make a note to Google how much this amazing machine costs and dream about having one at home. Unfortunately, it’s somewhere around USD3,000, so it looks like I’ll have to get my physiotherapy fix at the clinic. The spasms have lessened significantly. But like in the scary movies I’ve downloaded to help me pass the time, it’s more the anticipation of what’s about to happen that’s torturous. Every sneeze, every trip down the stairs, every reach to flick on a light switch could be the innocuous movement that triggers the next spasm. I’ve experienced full body cramps before, usually after a particularly physical tennis match, a pain I wouldn’t wish on my worst enemy. This isn’t as paralyzingly painful, but the constant tensing and releasing is equally exhausting. You don’t realize how much you use your back muscles throughout the day, say to throw your leg over a motorbike or to put on a shirt, and I’m starting to question all my life decisions, like why I had to put the coffee on the top shelf, or why I threw clothes on the ground and now have to spend 5 minutes slowly picking them up. I’m at the clinic for my third visit. Dr. Sandy has started me on some back exercises and very gentle stretches which I dutifully perform while binge watching entire seasons of television programs. My bedside table looks like a nurse’s station complete with liniments, pain killers and a hot water bottle. I’m thankful I scheduled no travel during Tet, as it’s the perfect time to stay home and recover. Friends come by bearing flowers, chocolate macadamia cookies and a bottle of wine, the perfect Get Well Soon ingredients. They ask me what medication I’m taking, and are surprised to hear that the doctor only prescribed magnesium and vitamin B6. The clinic’s mission is to address chronic pain without the use of drugs or surgery, instead relying on an alternative triad of manipulation, physiotherapy and acupuncture to treat the cause rather than the symptoms. One of the shows I watch features a catchy tune and I suddenly find myself dancing in my chair. It’s in that moment that I know I’m going to be fine. That is, until I get ahead of myself and feel a sudden twinge. Dr. Sandy says that’s normal; it’s my body’s way of telling me to watch my limitations. I come for one more visit before the clinic is closed for Tet. The spasms have completely gone. It’s just a lingering tightness and a sense of back fatigue that remains, something the doctor says will probably last for another week or two. He clears me to try playing tennis again in a few days. Dr. Sandy recommends I continue with my back exercises and finish my course of magnesium supplements and come back for a final check up in a few weeks. From debilitating pain to complete health in just six visits is nothing short of miraculous. I look up my records and note that a similar back problem five years ago in Phnom Penh required 13 visits to the chiropractor. I feel grateful to have my life back. When Dr. Wade Brackenbury opened the American Chiropractic Clinic (ACC) in 2006, it was the first legal chiropractic clinic to operate in Vietnam. After suffering a broken back in his teens and undergoing a year of rehabilitation, Dr. Wade went on to study Emergency Medicine in Idaho (USA), Chiropractic in California, and Acupuncture in Korea and China, and founded a number of clinics in Malaysia before moving to Vietnam. Since opening, ACC has treated more than 26,000 patients in Vietnam. ACC in Saigon currently has 12 doctors from a number of different countries, all with doctorate-level, American equivalency qualifications. The American Chiropractic Clinic is located at 161 Hai Ba Trung, D3. There is also a clinic in Hanoi.